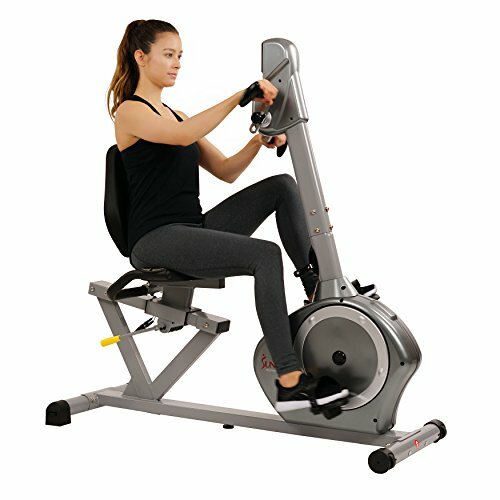 Why not just buy an upright exercise bike? Can I use my bike straight out of the box? Exercise is an important part of a healthy lifestyle, and that does not get any less true for older people, for whom it can help to know about the best recumbent exercise bikes specifically designed for seniors. You might have slightly different concerns and requirements from someone younger, but even for older users, there is a range of important considerations to take into account. Recumbent exercise bikes offer great exercise benefits without very much risk of injury, all while being designed for comfort and ease of use for people with limited flexibility. There are a lot of different recumbent exercise bikes for seniors on the market in 2019, but this guide should help you to narrow that down and find the best bike for your particular needs. 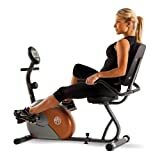 The Marcy Recumbent Exercise Bike ME-709 is an excellent, comfortable option with all of the advantages of higher-end upright exercise bikes packed into a safe, secure recumbent design. The frame is made from sturdy steel tubing, designed with as much open space as possible for ease of mounting and dismounting. This focus on space for your legs allows you to mount the bike however you want to, offering an easier experience for your knees and back. The Marcy ME-709 also offers counterbalanced pedals for maximum control and comfort and a well-padded seat as well as a feedback screen designed with extra-large text for easy reading. Why We Liked It – While some recumbent bikes compromise on the high-end features you might expect from a more premium upright bike, the Marcy Recumbent Exercise Bike ME-709 includes all of these luxuries while also focusing on the safety and comfort of older users. The Nautilus R616 Recumbent Bike offers a wide range of additional luxuries above most of its competition, allowing a more customized and relaxed workout experience for those willing to get to grips with its extra features. Built with an extra-sturdy design, the Nautilus R616 is ideal for slightly heavier users, supporting a maximum user weight of 300lbs. It offers a full 25 levels of resistance, 3 times as many as most of the competition, and 29 inbuilt workout programs to choose from. Users of all fitness levels and weights should be able to find something to suit them in that broad a selection of programs. It also offers full Bluetooth connectivity and a range of input ports for more tech-savvy users. Why We Liked It – Most of the unique features offered by the Nautilus R616 Recumbent Bike are luxuries rather than necessities and require a bit more of a technical mind to fully take advantage of than some others, but for those willing to put in the time and effort this is a spectacularly luxurious bike. 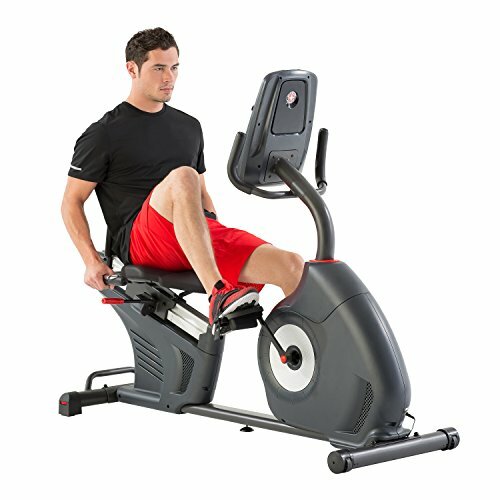 The Schwinn 270 Recumbent Bike offers all the same benefits as the Nautilus R616 discussed above, allowing you to connect your workout experience to that of your friends and to plug in all of your media devices to watch or listen while you ride, all while providing charge to anything plugged in. It also offers a second set of handlebars mounted alongside the seat, allowing for a wider range of comfortable riding postures for those who might not be entirely comfortable in the normal postures available on recumbent exercise bikes. The seat is ergonomically designed to ensure comfort in any of these possible positions, allowing the most stable and comfortable ride possible. Why We Liked It – A large and sturdy bike, the Schwinn 270 Recumbent Bike is customizable enough to fit pretty much any workout needs and user fitness level while offering a vast number of extras for those prepared to get to grips with the technical aspects. The Exerpeutic Recumbent Bike 900XL is a slightly smaller option than most of its competition, taking up a bit less space in your room. Its lower handlebars prevent it from dominating the space in which it is set up, keeping it unobtrusive and discreet. It is, however, fully adjustable, allowing you to raise and lower the seat and handlebars to fit whatever arrangement is most comfortable for you and your back. The LCD feedback display offers extra-large text, enabling easier reading, while a model with inbuilt Bluetooth is also available for those who want to connect their devices for entertainment during their workout. Why We Liked It – Smaller than most bikes available, the Exerpeutic 900XL Recumbent Bike’s customizable height makes it a great option for those in need of something that can be perfectly tailored for their height and level of flexibility. The Exerpeutic 400XL Folding Bike is an excellent option for those with limited space available, as it can be easily folded up and packed away when not in use. When fully erect it only offers a semi-recumbent design, so may be better for those with a little more flexibility and confidence, but it is still stable, safe and comfortable, coming as standard with extra-large padded cushions on both the seat and backrest for a more comfortable workout experience. The LCD feedback screen mounted above the pedals offers extra-large text for easy reading, tracking your distance, time, speed, heart rate, and calories burned. Why We Liked It – Ideal for those with more flexibility than space, the folding design of the Exerpeutic 400XL Folding Recumbent Bike allows it to be packed away far more easily than most on the market. The Schwinn 230 Recumbent Bike is one of the more adjustable recumbent exercise bikes on the market, with the seat mounted on a sliding rail for easy movement, allowing it to be adjusted to fit any size or level of flexibility necessary. In addition to this, it offers 22 different preset workout programs, allowing you to choose the workout routine best suited to your personal needs and preferences. It offers a smooth, comfortable workout experience, with a high-speed, high-inertia drive system for the easiest, smoothest startup possible. 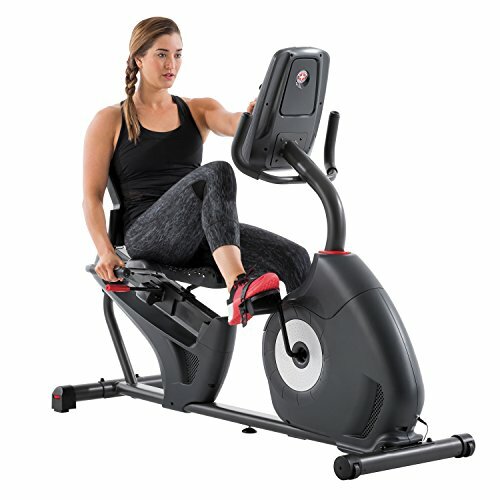 While most workout bikes offer a single LCD screen to track your progress, the Schwinn 230 Recumbent Bike has a dual screen design, enabling twice as many simultaneous feedback options. Why We Liked It – The Schwinn 230 Recumbent Bike is exceptionally customizable, allowing far more movement of the seat than most of the competition. 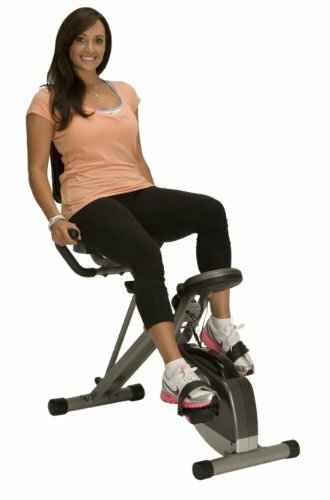 This is a great choice for those who want to ensure that their exercise bike fits them perfectly. The Exerpeutic 1000 High Capacity Recumbent Bike is one of the larger models on the market but is still exceptionally easy to adjust, with the seat mounted on a slider for easy, smooth movement. It can easily be adjusted to fit users ranging from 5’3″ to 6’3″ in height and is sturdy enough to support anyone up to 300lbs in weight. The Exerpeutic 1000 also offers a feedback screen with extra-large text for easy reading, showing information on distance, calories burned, time, speed, and heart rate (monitored through sensors in the handlebars). It also promises strong, stable foot straps, stabilizing your legs to prevent any unnecessary movement and wobbles. Why We Liked It – A large and easily customized bike, the Exerpeutic 1000 High Capacity Recumbent Bike offers a comfortable and sturdy design ideally suited for larger users, and an extra-large seat to ensure complete comfort for anyone. The Sunny Health and Fitness Magnetic Recumbent SF-RB4631 exercise bike is taller than most recumbent exercise bikes on the market, ensuring a comfortable ride with no need to stretch, risking discomfort or injury. Offering handlebars mounted both at the back and the front of the bike, with a second pair of grips on the front bars for those who prefer to hold them differently, the Sunny SF-RB4631 allows a comfortable workout for any preferred style of workout. Capable of supporting users weighing up to 350lbs, this is a sturdy piece of equipment designed to last. Preventing its large size from making it unwieldy, however, the Sunny SF-RB4631 comes with built-in transport wheels, keeping it easily mobile. Why We Liked It – The range of handlebar options on the Sunny Health and Fitness Magnetic Recumbent SF-RB4631 makes it a more flexible choice for people who prefer a slightly more upright posture to the relaxed posture of most recumbent bikes. The Exerpeutic 2000 High Capacity Recumbent exercise bike is a more comfortable and padded option than many others on the market, offering an “Air Soft” seat made from 3 ½” of air-chambered padding to disperse your weight and absorb shock effectively. In addition to this, it comes with sturdy armrests with their own padding and handlebars, allowing you to sit in an armchair-style seat while you ride. The bike comes with an 8 level magnetic tension control system, allowing you to customize your workout for your fitness level, and 6 preset workout programs for further adjustment to fit your personal exercise needs. Why We Liked It – The armchair-style seat of the Exerpeutic 2000 High Capacity Recumbent exercise bike allows for one of the most comfortable and stable rides on the market, with far larger and more luxuriously padded cushions than most of the competition and secure armrests. The Velocity Exercise Dual Motion Recumbent Bike is a tall design with raised handlebars, allowing a more upright workout than most recumbent bikes. It is exceptionally sturdily constructed, allowing you to ride with no fear of falling, and the height of the seat can be easily adjusted to fit any height of the user. The flywheel system offers a more natural riding experience, while the display screen features a hand pulse monitor system to track your heart rate during your workout. 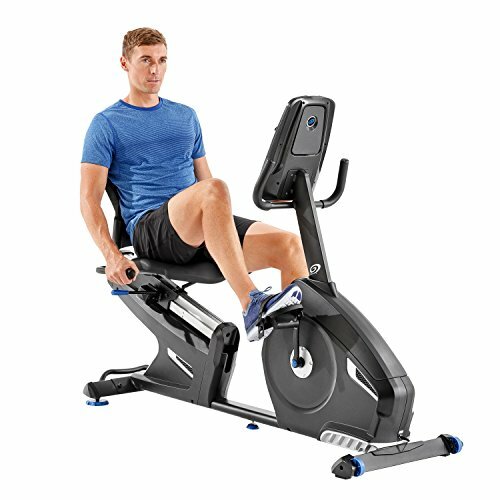 The Velocity Exercise Dual Motion Recumbent Bike is exceptionally easy to assemble, allowing you to get it up and running out of the box in the shortest possible time. Why We Liked It – Sturdier than many alternatives, the Velocity Exercise Dual Motion Recumbent Bike is great for anyone who wants to ride in a more upright posture with no fear of falling. There are a range of different seat designs available on the market, and which you should choose will be dependent on your particular needs and level of flexibility. Some of these recumbent bikes for seniors have extra-large cushions, while others offer smaller cushions with a more ergonomic design. In general, the ergonomic designs are better if you’re not going to need to adjust the bike at all, while the larger cushions allow for comfort in a wider range of riding postures. Most of the bikes discussed above offer larger, more padded upright seats with strong back support, promising a comfortable and relatively stable ride, but some also provide strong armrests, adding to the comfort and security of the bike. Recumbent exercise bikes with armrests are likely to offer a more relaxed riding experience, while also providing something easy to grip onto if you need some reassurance of the bike’s stability and safety. 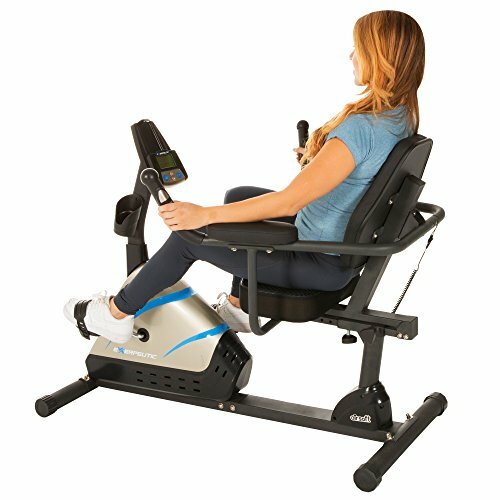 One of the most important considerations when buying a recumbent exercise bike is that of space. How much space you have available is naturally going to affect which of these options is best for you. The larger bikes may seem more inconvenient, but they tend to offer a greater level of stability and security. Smaller options, such as folding bikes, are great for those with major space constraints, but if you’re more worried about accidents and the stability of your exercise bike, it may be worth prioritizing that over space and going for one of the larger, heavier models instead. Most exercise bikes come with feedback screens, offering you information on the distance you’ve ridden, your heart rate, the calories you’ve burned, and how fast you’re riding. Only some, however, display this information in large, accessible text for easy reading. If this feedback is something you particularly care about, then it is definitely worth considering the size of the screen and its text when deciding which bike to buy. If, on the other hand, you aren’t particularly interested in the quantified feedback available on your workout, then perhaps the feedback display should be a lower priority, allowing you a wider range of choices. If you think you are likely to be moving your bike around at all, consider either a folding model or one with transport wheels. The folding options are a little less stable and sturdy than some of the larger models, but the flexibility they offer through being foldable and easy to both pack away and transport elsewhere may be worthwhile. Halfway between this and the larger options is the range of models with transport wheels. These are not foldable, and therefore do not pack away into such a small space, but can be moved around the room more easily than some stationary models. In addition to this, they do not compromise on stability at all, offering a ride just as safe as any of the larger stationary options. 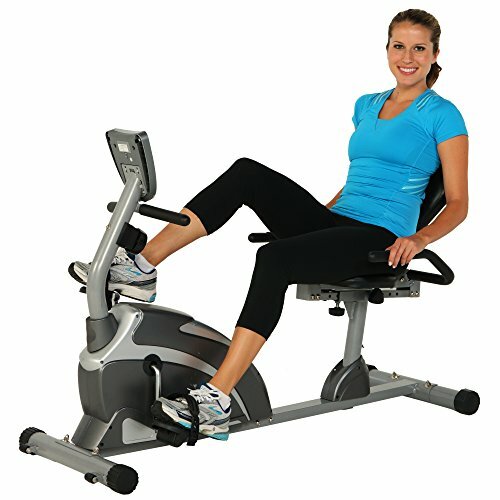 Recumbent exercise bikes are generally larger and heavier than upright exercise bikes, taking up more space in your house and generally being a little less convenient. This inconvenience, however, is more than made up for by their increased ease of use. For those with stiffer legs or backs, recumbent exercise bikes allow easy exercise, while the barrier to even getting on an upright bike could be insurmountable. The recumbent bikes discussed above have been designed for ease of access, ensuring that even stiffer users can climb on and start their workout with the minimum of effort and struggle. What about extra technological features? 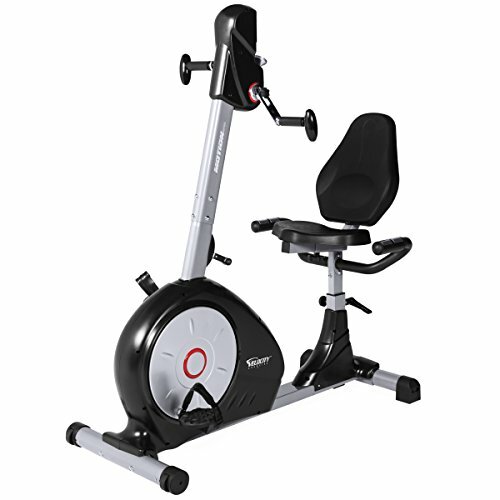 Many of the recumbent exercise bikes discussed above come with features such as Bluetooth, USB charging ports, media stands, and inbuilt speakers. These may well be unnecessary for you, or even inaccessibly confusing. That isn’t a problem, though; none of these features are integral to the design of the bikes, and even a bike that focuses its marketing on its connectivity or technological advancement will be easy to use as a straightforward exercise bike, completely ignoring these extra features. If you’re feeling more confident with such things, however, they can prove nice bonuses, enhancing your ride with easy access to music or other entertainment during your workout. These are very much optional extras for those who feel like getting to grips with the technology, not required parts of the bike that you have to learn to use. Most exercise bikes are going to require some assembly when you first open the box. You aren’t going to be able to just pull it out of the box and get started. Fortunately, though, the assembly required is usually fairly straightforward, consisting simply of connecting a few separate parts. None of these are going to require any extreme technical knowledge to put together and should be practical for most people to assemble on their own without needing extra tools or other equipment. There are a huge number of recumbent exercise bikes for seniors available in 2019, and this range of choices can seem intimidating when you’re first setting out to buy one. Within this vast selection, though, the options discussed above are some of the best on the market right now. Whatever your personal needs and wants from a recumbent exercise bike, there should be something ideally suited to your personal requirements in this list. With the help of this guide, you can buy with confidence, knowing that you are fully informed about the benefits and features of each of the options. Any of these bikes would be a good choice; they’re all designed for the needs of seniors, with safety in mind, and should fit most of your needs well. If you have particularly specific needs, though, then buy whichever of those listed above meets your requirements best, safe in the knowledge that it’s one of the best on the market.